While he wasn't doing any new work for Marvel in the early 1970s, you could count on a regular supply of Ditko from the company in the form of reprints, especially of his short fantasy and science fiction stories. 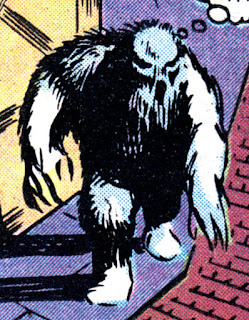 Case in point, GIANT-SIZE MAN-THING #1  has a reprint of "The Ice-Monster Cometh" from AMAZING ADULT FANTASY #11 , an entertaining 5-page story about Hugo Bogg, a jewel thief who hides his loot for years, and plans to use the local myth of an "Ice-Monster" to recover it. Lots to like about this story. As usual, Ditko does well with the rustic European setting, and Bogg is a suitably weaselly looking ne'er-do-well.